Washington, DC – September 26, 2016 – DRI’sWorldwide Campaign to End the Institutionalization of Children is featured today in the Guardian. The Guardian article includes interviews with Eric Rosenthal, Executive Director of DRI, and Laurie Ahern, President, as well as photos from DRI’s investigations. A young boy in a Georgian institution. Photo by Rob Levy. The goal of the Worldwide Campaign to End the Institutionalization of Children is to challenge underlying policies that lead to abuses against children on a global scale. One of the main drivers of institutionalization – particularly in developing countries – is the use of misdirected foreign assistance funding to build new institutions or rebuild old crumbling facilities, instead of providing assistance and access to services for families who want to keep their children at home. The dangers of institutionalizing children are pervasive and take place all over the world, including well-resourced, developed countries. 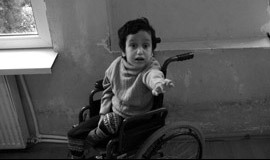 Disability Rights International is calling for an end to the institutionalization and abuse of children. Click here to read the article on the Guardian’s website.